5 Things You Might Know About TCU…and 5 Things You Might Not! College Visits are a great way to check out a college for yourself, and see how you feel on the campus. Summer visits don’t give you the usual hustle and bustle feel, but there will usually be some students there, and a quiet, subdued visit is better than no visit at all! If you are a sophomore or junior in high school right now, it’s definitely time to start thinking about your college visits – a perfect time to see what a school you might be considering is really like without solely relying on their website or brochure. Seniors might choose to make a visit before they send off their applications, or wait until they have been accepted instead. With all of the colleges out there, how do you begin to narrow your college search? Check back with our blog frequently (or better yet-sign up to get our blog sent straight to your email), as we will be posting things we have observed on our most recent college visits. Today, the KaMi Spotlight is on Texas Christian University, located in Fort Worth, TX. The pictures are from our visit there in June of 2015. • A campus filled with an infinite amount of school spirit. Their mascot, the Horned Frog, can be found everywhere on campus. • Division I, and part of the Big 12 Conference. • Enrollment for 2014 was approximately 10,033 students. • Cost to attend (2015-2016) is $53,480 a year. • The student to faculty ratio is 13:1, with an average class size of 27. • TCU has active and involved students…there are over 200 clubs and organizations and 35 fraternities and sororities to choose from. • There is a two year on-campus living requirement. • Besides the many places to eat on campus, a student’s Frog Bucks are accepted at 30 locations around town. • Students are required to take one class of Religious Traditions, but there isn’t a chapel requirement. • TCU offers 8 colleges and schools with over 100 majors from Actuarial Science to Writing. Students take a core curriculum that stays with them if they change their major. TCU offers big-time athletics, opportunities, and experiences in Ft. Worth, the 17th largest city in the U.S. (and where “cowboy meets culture”). If you get to visit here, you will have lots to do and see! King Hall- one of twenty residence halls. We peeked into one of the classrooms, notice the purple here? A common area in one of the dorms. Head football coach Gary Patterson (who used to coach Kate’s husband, John, at Sonoma State). A trophy case dedicated to a former San Diego Chargers’ player and former alum LaDainian Tomlinson. It’s not everyday that you get to check out the head coach’s office and trophies! The view from Coach Patterson’s office…amazing! Coach Patterson’s secretary was too kind- she let us take a picture of a championship ring AND her own pendant! TCU students get to sit right behind the bench (of the opposing team!). 5 Things You Might Know About Baylor University…and 5 Things You Might Not! Today, the KaMi Spotlight is on Baylor University, located in Waco, Texas. The pictures are from our visit there in June of 2015. • A 1,000 acre campus steeped in traditions that go back to 1909. • NCAA Division 1, Bears, and part of the Big 12 Conference that offers 19 sports. • Enrollment for 2015-2016 was approximately 16,787 students (undergrad and graduate). • Cost to attend (2016-2017) is $59,252 a year. • The student to faculty ratio is 14:1, with an average class size of 27, though the largest class size is around 150. • The Moody Memorial Library has a stoplight system inside for noise (with zones like Red=No talking allowed.) The largest collegiate Starbucks in the nation can be found inside. • Baylor University was founded in Independence, TX in 1845, but moved to the current location in Waco in 1886. •Each student is required to complete two semesters of Chapel, along with two religion courses. • The Bear was established as the mascot in 1914, and you will hear students call out “Sic ’em!” as you walk around campus. Your tour guide will probably teach you the proper way to act this out too! Baylor University is highly ranked for both the school and many of its departments. If you ever find yourself in Texas, make sure to check it out! What a great spot to study! Baylor claims this 53′ rock wall tops TCU’s. So many beautiful brick buildings on this campus. 5 Things You Might Know About Azusa Pacific University…and 5 Things You Might Not! If you are a junior in high school right now, it’s definitely time to start thinking about your college visits – a perfect time to see what a school you might be considering is really like without solely relying on their website or brochure. With all of the colleges out there, how do you begin to narrow your college search? Check back with our blog frequently (or better yet-sign up below to get our blog sent straight to your email), as we will be posting things we have observed on our most recent college visits. Today, the KaMi Spotlight is on Azusa Pacific University (APU). • APU is a small, private Christian college divided into a West and East campus in Azusa, CA. The average class size is 19 students. • Cost to attend with room and board is approximately $40,000 a year. • Enrollment for 2012-2013 was around 5,500 undergrad students and approximately 10,000 total students. • The second largest Christian University in the U.S., 1st largest on the West Coast. •Approximately 2,300 students have an on-campus job, working 10-15 hours a week, around their class schedule. • A trolley runs every 7 minutes, taking you back and forth between the East Campus and the West. •Chapel is required 3x a week, along with 18 units of Biblical Studies. • There is a greenhouse on the roof of the Segerstrom Science building. A BBQ is held monthly on the patio for the Science professors and students. Azusa Pacific focuses on its 4 cornerstones of Christ, Scholarship, Service, and Community. It offers many opportunities to develop oneself in these ways. APU also is very clear on its beliefs: make sure to do your research at http://www.apu.edu/about/believe/ to decide if APU might be the right fit for you! Turtles can be found in the courtyard of the Segerstrom Science Center. One of the 4 dorms on campus. This is an inside, hangout area in one of the dorms. An example of a dorm room on campus. A sneak peek of a class in session! The Rose Garden is located in the only original building remaining on campus. 5 Things You Might Know About Chapman University…….and 5 Things You Might Not! Today, the KaMi Spotlight is on Chapman University, located in Orange, CA. 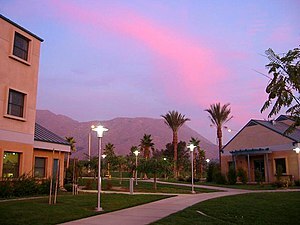 • Chapman is a small, private college nestled right in the middle of a quaint residential area. Many of the houses surrounding the campus are owned by the University, and are home to Professors and their families. • Cost to attend with room and board is approximately $60,000 a year. • Enrollment for 2012-2013 was around 5,000 undergrad students and approximately 7,000 total students. • A NCAA Division 3 school in the SCIA Conference consisting of 12 Southern California private schools. • The average class size is 20-25 students, and the most popular programs are Business, Communications, Psychology, and Film Production. •The 4-story Library is actually 9 libraries in one, with 50 study rooms, and a Holocaust Memorial Library on the top floor. • About 33% of the students participate in Greek Life, with 16 different Greek organizations, but there are no Greek houses on campus. •Chapman displays the 2nd largest piece of the Berlin Wall (owned by an American university) in Liberty Plaza. • Included in the cost of tuition is Interterm, an opportunity to take a course or study abroad during the month of January (between semesters). If you participate in Interterm all 4 years this equals a “free”, extra semester of college, and gives you a chance to experiment with classes outside of your major. • 92% of freshmen live on campus, usually 3 to a room, and there is a gym and an outdoor pool just for students living in the dorms. Global Citizens Plaza, where each flag represents a student’s country, or a country where a Chapman student can go to study abroad. We thought this was clever…a station to fix your bike! Sand volleyball court right near the dorms! The 4 pillars of Chapman – Spiritual, Social, Physical and Intellectual. Attallah Piazza Center- a student hangout spot! 5 Things You Might Know About Cal Baptist University……..and 5 Things You Might Not! • Cost to attend ranges from around $28,432 for the commuter student and $36,172 for tuition with room and board. • Besides offering financial assistance based on need, CBU offers grants and scholarships for academics, art, music, journalism, athletics, drama, and engineering. The academic scholarships start at $4,500 for a GPA of 3.3-3.74 and go up to $8,000 for a 4.0 and above. These scholarships are per year, as long as the minimum GPA is maintained. • Enrollment for 2012-2013 is just around 4,000 undergrads but the school is envisioning an expansion to 8,080 by 2020. • A Division 2 school currently transitioning from NAIA to NCAA in the Pac West. • Over 100 majors with some of the most popular being Business, Education, Nursing, and Engineering. •70% of the students live on campus in Male or Female dorms, cottages, or on-campus apartments. • Most general ed classes have around 28 students, but the average is 21 students per class, with the largest classrooms holding 70 students. •The recreation center is brand new (just opened in January of 2013) and 3-stories. It offers rock-climbing, cardio equipment, racquetball courts, and workout rooms for classes. The basketball flooring is Grade 1 (NBA quality). On the roof of the building is a futsal field and turf track. • There are no Greek organizations at CBU, but there is a big focus on community life. Clubs, recreational sports, and weekend excursions are available, and many participate. Specialty workshops are offered through the career center with topics such as “Business Dinner Etiquette (Which fork do you use??)”. • 100% of the faculty are Christian and Chapel is required 15 times each semester for students who are encouraged to “live their purpose”. Even though we visited CBU during the summer season, with very few students on campus, we really got a feel for the opportunities that students are given to connect to each other and their school. Time to start our tour at CBU! This is the view coming out of the cafeteria. The cafeteria (which is All-You-Can-Eat Buffet style). Our tour guide, Mikayla, took us all around the campus on a golf cart! A very clean and state-of-the-art classroom. A dorm room in the Women’s dorms. A peek at the baseball field. Futsal and an outdoor turf track on the roof of the Rec Center. 5 Things You Might Know About UCR…and 5 Things You Might Not! If you are a junior in high school right now, it’s definitely time to start thinking about your college visits – a perfect time to see what a school you might be considering is really like without solely relying on their website or brochure. With all of the colleges out there, how do you begin to narrow your college search? Check back with our blog frequently (or better yet-sign up to get our blog sent straight to your email), as we will be posting things we have observed on our most recent college visits. • There are over 360 Greek organizations on campus. • A Division 1 school in the Big West Conference playing big name schools like USC and UCLA with 17 sports teams. • Enrollment for 2012-2013 is just over 21,000 and most of them are Undergrads. About 30% of the students live on campus. • Cost to attend ranges from around $23,000 to live at home while attending to $37,000 for out-of-state residents. • A GPA of 3.0 is required to apply along with the ACT with Writing or the SAT Reasoning test. •Larger class sizes (could be a concern to someone who is looking for a smaller environment) of 100-220 students for the GE classes with the largest auditorium holding 538 students. • Ranked as the 8th most diverse university in the nation. •4 libraries on campus, all with computer labs. • An Honors Program is available for qualified students that ensures priority registration (even above athletes). • UCR is a public, research university that partners with many outside agencies for development and advancement. To us, UC Riverside seemed very well organized and had a studious vibe. Many students were walking around with headphones on or studying in quiet areas. With its Medical School opening in August of 2013, we are sure this high quality school will continue to grow in size and reputation. 5 Things You Might Know About UNLV…and 5 Things You Might Not! We toured this school on May 14th, at a lovely 93 degrees for our 10:00 A.M. tour. We would suggest that you not wait much longer if this is a school you are interested in visiting! • A 332 acre campus which includes an 80 acre arboretum. • A Division 1 school in the Mountain West Conference. • Enrollment for Fall of 2013 was 27,848 students but only about 2,000 live on campus. • Cost to attend (with housing) is around $33,270 a year for out-of-state residents. • The Thomas & Mack Center seats over 19,000 and is the home to the UNLV Men’s basketball team. • Lied library is 5 stories and bigger than the Thomas & Mack Center. It holds over one million books with another 600,000 books held in storage that can be retrieved by a robotic arm upon request. • The Student Recreation and Wellness Center is 4 floors and includes a swimming pool, indoor soccer and basketball, cardio machines, and an indoor track. •The Schools of Business and Hotel Management are the biggest. • Most of the freshman dorms feature two bedrooms that share one bath. Brita water-filling stations are located on campus for students as well. • There are 70 emergency phones on campus, with 30-40 police officers. The average response time to a call made at one of the phones is 30 seconds. We were surprised to note how shady the campus was, with lots of grassy areas under trees. As the average age of a student at UNLV is 24, the campus has a slightly mature feel, and while signs of school spirit were present, they weren’t everywhere. The majority of the students here are in-state, and mostly locals to boot. Las Vegas Shade found on campus. The School of Law at UNLV. 5 Things You Might Know About Cal Poly SLO…and 5 Things You Might Not! Today, the KaMi Spotlight is on California Polytechnic State University- San Luis Obispo (Cal Poly SLO). • A sprawling campus with a bustling, small-town feel. • A Division 1 school in the Big West Conference. • Enrollment as of October 2015 was 20,944 students (undergrad and graduate). • Estimated cost to attend for California residents for the 2016-2017 school year is $26,139. • The average time to graduate is 4 years and 1 quarter. • The motto at Cal Poly SLO is “Learn by Doing”. • The campus has 2 climbing walls and a bowling alley. •The library is 5 stories tall-making it the tallest building in all of San Luis Obispo. • The College of Engineering is the biggest college but Cal Poly also has an extensive Ag Department. • The biggest sport is Soccer, and Cal Poly’s main rival is UCSB. Although Cal Poly SLO is a California State University, its requirements for admission are slightly more stringent than other State schools. Cal Poly seems to balance education and athletics, offering numerous opportunities to participate and be active and involved. Kate with Head Football Coach Tim Walsh. 5 Things You Might Know About UCSB….and 5 Things You Might Not! Today, the KaMi Spotlight is on UCSB. The pictures are from our visit there in the Spring of 2013. 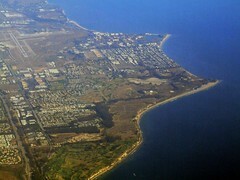 • Located in Goleta, CA, on a sprawling ocean-side campus that even boasts its own beach. • Enrollment for 2014 was 23,051 students. • For the 2015-2016 school year, the cost to attend (for a California resident living in the residence halls) was $35,313 a year. • In addition to the standard tests you might be taking or have scheduled, UCSB also requires that you complete the ACT Assessment + Writing or SAT Reasoning tests. • UCSB has a very social student body, strong school spirit, and over 400 clubs. • 1 out of every 5 students studies abroad. • There are over 14,000 bikes and over 7 miles of bike paths on campus. • The library is 8 stories tall, and you are allowed to bring food in (or even have pizza delivered there). • The College of Creative Studies has approximately 300 students and is a graduate school for undergrads. UCSB’s mild weather and beach access make it a great school for someone who wants to be outside and involved! Overlooking the lagoon, with the beautiful Pacific Ocean in the background!